In technical terms, Christine Clark is a Certified Cheese Professional. In her own words, she is a “really passionate geek.” This makes her well-qualified to teach classes about cheese, and as the Assistant Manager of Education at Murray’s, that’s exactly what she does. 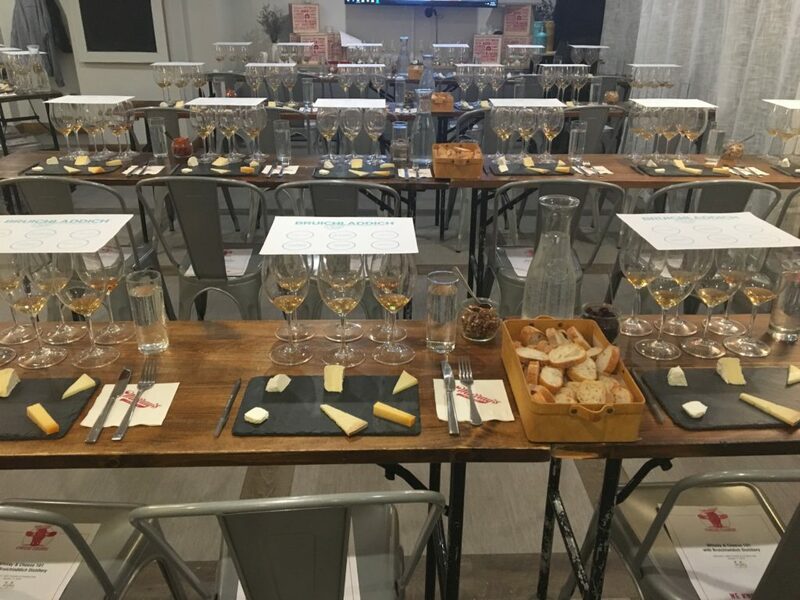 Every day at our shop on Bleecker Street, Christine and her team lead cheese-centric classes. Examples include Cheese 101, Burrata Making, and Spanish Wine & Cheese. What happens in a class like this? For one, there’s a lot of cheese eating involved. This includes no less than six varieties, often featuring reserve products that are exclusive to Murray’s. And if you’re doing a pairing class, there’s always a beverage to go with each one. 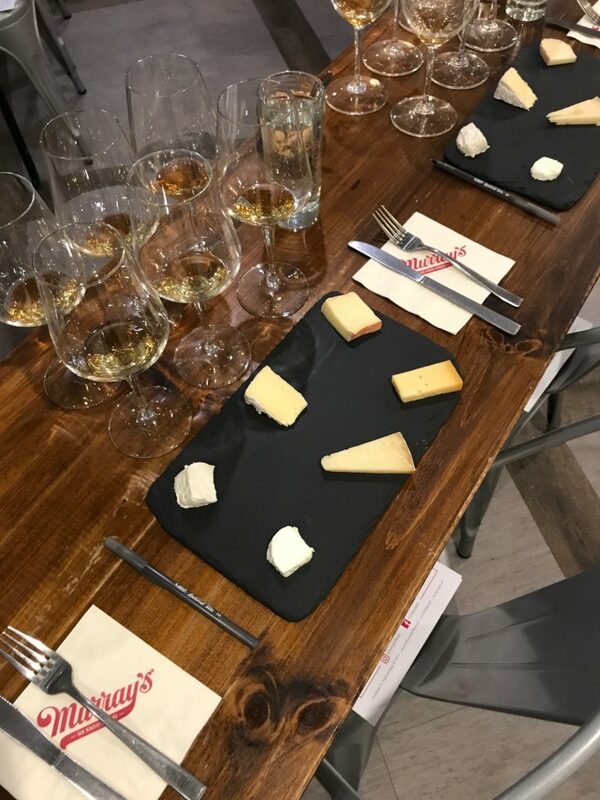 That was the case last week, when we teamed up with Bruichladdich Distillery for a special installment of our Whiskey and Cheese series. Though we tend to think that the natural pairing partner for cheese comes from grapes, it is just as sensible for your pairing to come from grain. Scotland is the undisputed whiskey capital of the world, and within Scotland, the most legendary region of production is a small island off the west coast called Islay. There are only eight distilleries on Islay, and Bruichladdich is one of them. We were fortunate enough to have one of Bruichladdich’s ambassadors, Jason Cousins, present to co-teach the class with Christine. Indeed, he was right. Jason gave an overview of whiskey in general and Scotch in particular, and though it was as nuanced as the Scotch itself, it was also just as smooth. He and Christine had met the week beforehand to taste through Bruichladdich’s whiskies and test out pairings for each one. According to Christine, the general rule of thumb when devising pairings is: “One plus one should equal three.” This is not to say she is bad at math, but rather that, when combining the experience of one product with the experience of another, they should create a sensation that is greater than the sum of its parts. That was certainly the case with the pairings we tasted. 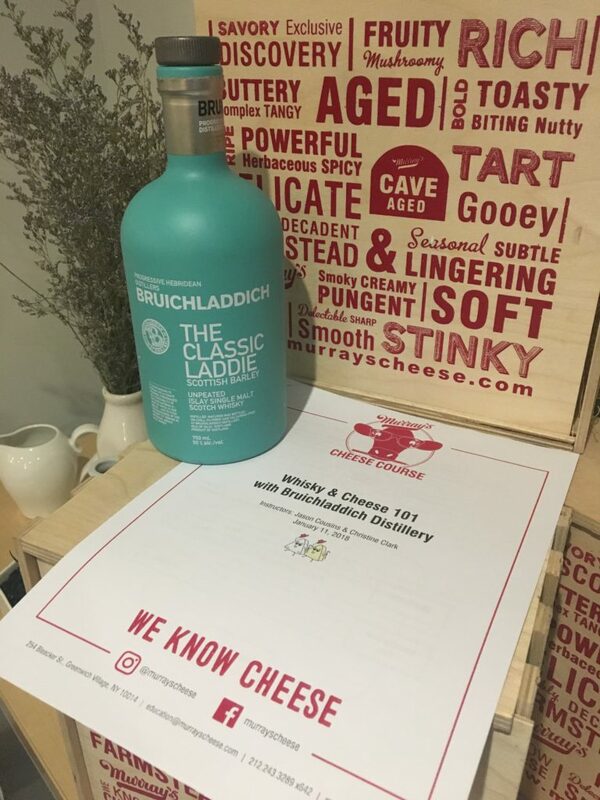 We began with the Classic Laddie, Bruichladdich’s flagship expression. It is unpeated and imminently drinkable, and its flavors of apple, melon, and vanilla brought a whole new dimension to Sweet Grass Dairy’s Green Hill, a bloomy rind cheese with a deeply buttery quality. On the other end of the peat spectrum is Bruichladdich’s Octomore 7.1, which has the distinction of being the peatiest whiskey in the world. What can stand up to such a formidably smoky Scotch? That would be Up in Smoke, an Oregon goat’s milk cheese that is smoked over maple wood and then wrapped in smoked maple leaves. You may think that this would lead to smoky, peaty overkill, but both products are so expertly made, so impressively controlled, that they each brought out new characteristics in the other. 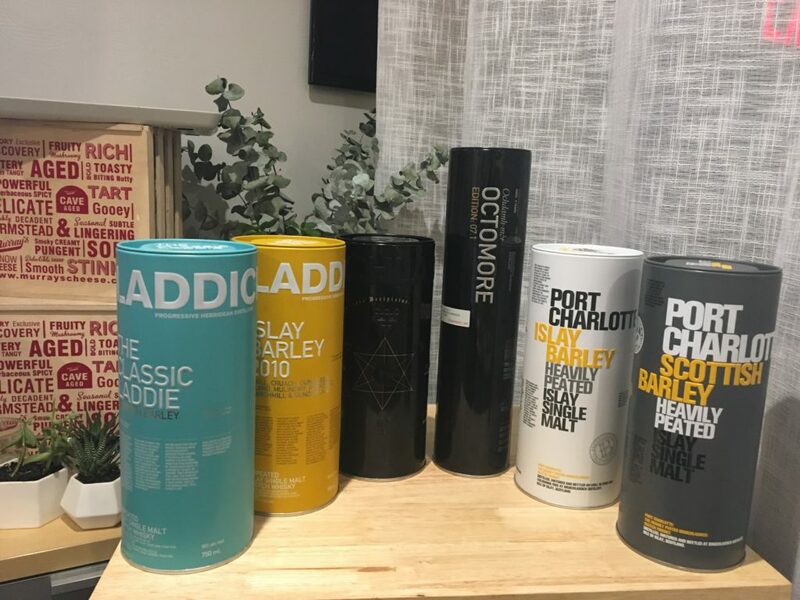 Octomore typically goes for around $170 a bottle, which is one of the reasons we love doing tasting classes—you get to experience products you might not otherwise consider. This is especially true with one of the class’s favorite pairings of the evening: Roomano Extra Aged Gouda and Bruichladdich’s Black Art 5. The Black Art series is Bruichladdich’s most exclusive expression, and the version we tasted had been aged for 24 years. It’s a spirit that is certainly worthy of its $400 price tag. Rich and desserty, it complemented the most aged cheese on the night’s slate, creating what one attendee referred to as the ultimate after-dinner bite. By the end of class—as is so often the case—most everyone found themselves with a fuller stomach and a brighter brain. There was also a consensus that the ability to notice and enjoy flavor grew as the class progressed, in spite of any well-documented effects that alcohol may have on the palate. This is because our capacity to appreciate something increases the more we know about it. Cheese class makes cheese taste better, plain and simple. It also happens to be a great time—regardless of what you are imbibing. So, we’d love to have you in our classroom. With nine classes every week, there’s certainly something that’s right up your alley. You can take a look at our schedule to see for yourself. We hope to see you soon!